Celebrate Halloween With Hershey's #Giveaway CLOSED!! Nothing says Halloween like candy! One of my favorite candies in the whole world is Kit Kat! I have had a love for Kit Kat’s since I was little. Every year since I could remember digging for Kit Kats in my trick or treat bags was a first priority as soon as I would get home from a night of trick or treating!!! To keep the Kit Kat tradition going, I make sure that we get plenty of Kit Kats to give out to our trick or treaters every year so that they can enjoy the same excitement I enjoyed as a kid. Now I do have to admit, since Kit Kats are a weakness, I do hoard away a few of the Kit Kats for myself every year. This year we were sent a great Halloween pack of candy from Hershey’s. We were sent a bag of the Hershey’s Seasonal Shapes Assortment with 75 snack size pieces, and a bag of my favorite, the Kit Kat Mini’s! On top of this great Halloween assortment of Hershey’s candies, we also received a great collection of classic spooky music CD, the Creepy Classics Halloween’s Greatest Hits CD! This Cd is going to be perfect to play on Halloween night when all of the little trick or treaters come by to get some candy!!! 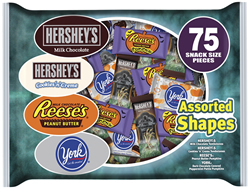 The wonderful people from Hershey’s are also going to give one of my amazing readers a Halloween pack as well that will include their own Creepy Classics Halloween CD along with some great products from the Hershey’s Halloween collection!!! *** And don’t forget to join us for the Twitter Party on Thursday 10/13!! There will be great prizes given away – you can RSVP on ResourcefulMommy.com. Tell me what candy you like best at Halloween!! Please leave your email with this entry. I love reese PB cups . entered star wars + big g.
I love the York peppermint patties. Thanks for having the contest!